The causes of homelessness are many, i don’t mean to suggest that it can simply be solved by making housing available, but i was struck by a sense of failure, of my own failure to address the issue, and of our wider social failure. In the twenty first century, in western, wealthy, liberal, democracies, homelessness should surely be a solvable problem. Surely, if we claim to be a civil society, nobody should be left in the cold. It’s that question of ‘civil society’ that i want to explore today, in a rather early stage reflection on what ‘civility’ means, and within the broader context of social justice, equality, fairness, and community. If we leave anyone behind, are we entirely failing? I recently explored the notion of aggregated cultural failure, so the irony struck me, that if we simply find opportunity and social acceptance for the enabled, empowered, and wealthy, few, we are not achieving a homogenous cultural benchmark, but rather allowing disempowered subcultures to exist. Indeed, worse, we are wilfully blind to them. How we address this, i do not know: do we align surplus with need, do we ‘game’ the situation, crediting those who do something to solve it, do we use social security systems to address it, do we rely on individual benefactors, NGOs, or charities? Do we ignore it, or do we address it? And under what conditions do we get to claim the title ‘civil’, or, for that matter, ‘society’. In one of my sessions last week, i shared the recent work on tribes (and tribes of tribes). Networks of networks. I explored definitions of ‘community’ with the group, and one notion that came up was that communities always exist in opposition: i kind of agreed with that, that one definition of a community can be a negative exception e.g. that i am a member of an empowered community as defined by the definition that i am not homeless. To be homeless does not require active engagement with a homeless community, but rather simply requires you to fall out of the system of those with homes, those with a roof over their head, and the means to sustain it. That’s an interesting notion, because it ties into the notion of ‘coherent’ community: a coherent community has shared purpose and values. So those of us with homes may be in a coherent community, defined by our empowerment and home ownership (or access to shelter), whilst those without may not be united in shared value or purpose. They are simply aggregated by their lack of something that the rest of us have. That led me to the sketch i shared above, not as a comprehensive exploration, but an idle sketch: what is it that we, empowered, enabled, have from civil society? What is it that, if lost, can move us into a subculture of exclusion? Let me play with some ideas around the purpose of society, how we know we are ‘within’ it, and how we can be excluded. Perhaps four areas: ‘safety’, ‘duty’, ‘fairness’, and ‘freedom’. If we wish to claim the title ‘civil’, which is really a totem for ‘coherent’, there is some sense that we offer ‘Safety’: that’s a foundational condition of community, that we are somehow held safer together. We provide security, through shared provision, and specialism. Some people can afford to be scholars, because others are dedicated farmers, so we can both advance in science, and eat at the same time. This differentiation of labour is part of a condition for community, but if we are dispossessed from any aspect of the shared output (be that knowledge, or food), then we have fallen out of the Social Contract that exists. Sure, we are no drain on the system, but we are not contributing either: we are equity neutral, and dispossessed. Shelter is surely one part of this ‘safety’, shelter from the storm, shelter from persecution, shelter from poor data, any number of contexts, but a roof over your head must be foundational. 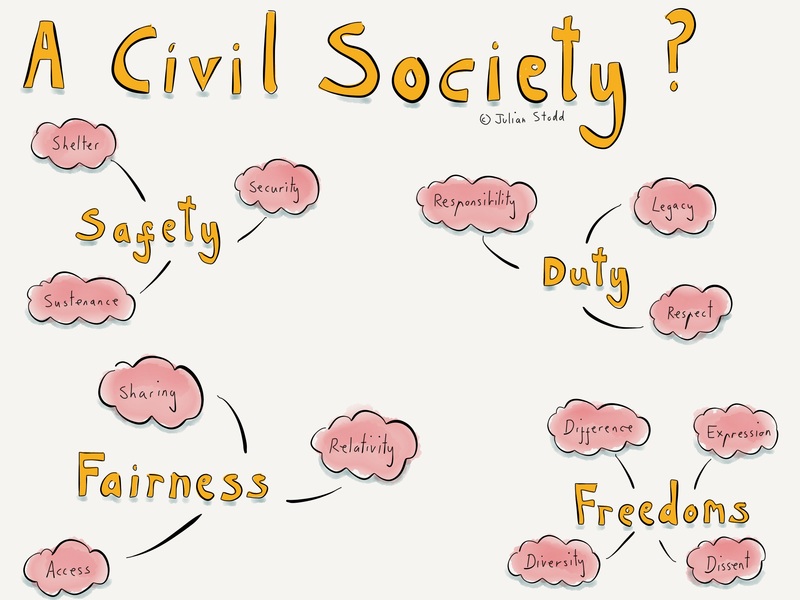 I am keen to see aspects of ‘Duty’: to be a member of a civil society requires us to take responsibility. Again, you cannot withdraw unless you deposit, and it’s neither synchronous, nor directly reciprocal. Take taxes: i pay my taxes, and i use services, but there is no direct correlation between the amount i pay, and the number of roads i can use, or the amount of clean water i can drink. Sure, the line blurs as we move to private/public partnerships, but essentially, it’s a non linear relationship. Taxes are a duty, infrastructure is a right. If you are in the system. There may be some aspect of ‘legacy’ to duty: a sense that we input into the system not simply for this generation, but for future ones. A duty to leave something better to our successors. And i feel sure there is a duty of ‘Respect’: for each other, and for the system. Not mindless compliance, but at some level, a respect for shared infrastructure, and for the system that provides it, as well as all others who inhabit it. it’s hard to see how society can be coherent without some form of shared respect. 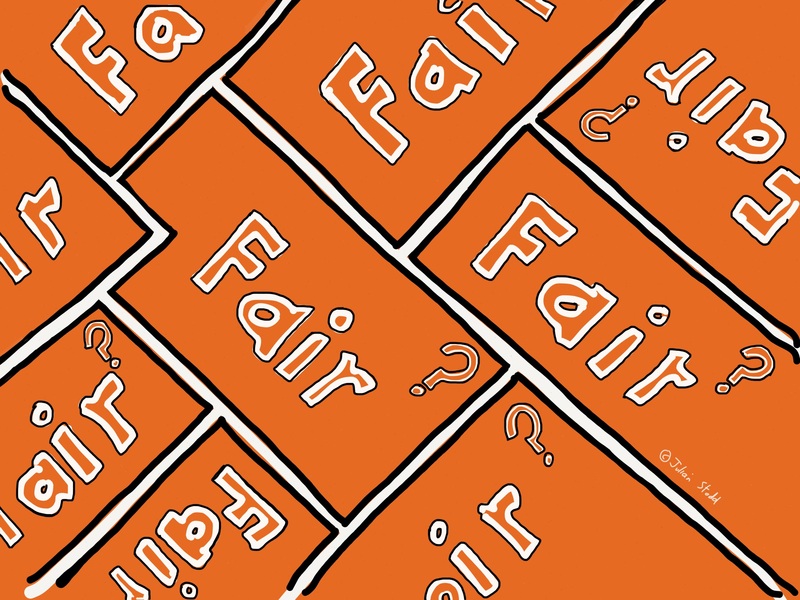 I include ‘Fairness’, because there has to be at least some notion of balance within the system: shared access, so what you can access, i too can access. This is something important: if i have greater access than you, then we are not equal, and if we are not equal, then can that be fair? I don’t mean access to luxury: it’s not about us all having a four bedroom house and a hot tub, but rather access to shelter, access to food, and not just upon our ability to pay cash. Our right to access must surely simply be a duty on society, and a right for our fair engagement. At which point i may risk the ire of my American friends, who see our UK system as a more socialist affair. But i’m not really talking about capitalism, socialism, or any other ism. This is about civility, fairness, and right. Sharing may be an aspect of fairness: if i have a disproportionate amount of resource, i may have a moral, if not legal, obligation to share. This was almost my starting point: if we, as society, have shelter, do we not have a strong moral obligation to make that shelter available? No matter what the associated risk of abuse of trust, or complicating factors, our civility will be judged by the generosity and fairness of the action, not the action of the person we act fairly towards. There is something about relativity too: if i have far more than others, do i carry a greater social obligation to help? Or is the burden carried equally? To give one percent of a little is surely as worthy as one percent of a lot? But empowerment may not be linear like that: if i have ten times as much wealth as you, i may be more than ten times better off, in real terms, in quality of life. Finally, there is ‘Freedom’. An aspect of a civil society is the freedom of difference: choices to be peripheral, sub cultured, varied, and diverse. A freedom even to dissent. That freedom cannot result in exclusion, or we fail in our civility, and certainly in our social obligation. Much of this plays out in different of our societies: is it ‘fair’ in civil America that people are disenfranchised through the colour of their skin? Through growing up in certain cities or streets? The growing movement for social justice reflects this: young black men and women saying ‘enough’, saying ‘i cannot in conscience condone this’. Exercising their rights. But closer to home, i see this: if we treat homeless people as criminal, as detritus on the street, or as someone else’s problem, we are doing so at the cost of our civility, possibly at the cost of our society. To reiterate: i understand that homelessness is a complex issue. But so is rocket science. Just because it’s hard, doesn’t mean we shouldn’t tackle it. And some parts of the solution may need to come first. As we head into another cold winter, why is it that thousands of men and women, even children, sleep rough, when we have shelter to give. This is not an issue of money: it’s an issue of civility, and our right to claim the title ‘civilised’ and ‘society’. We are sometimes best judged not by the good that we do, but by the good that we choose not to do. Perhaps our sense of good can also be judged by opposition: if we fail to do what is right, where does that leave us? This entry was posted in Culture and tagged Culture, Exclusion, Fairness, Homelessness, Longreads, Rights, Society. Bookmark the permalink. 11 Responses to A Civil Society?